I recently finished up my review of the XF 18-55mm F/2.8-4 OIS, the “don’t call it a kit lens” kit lens. As I posted in social media after my last set of body reviews and comparisons, I’ll focusing on lenses for the next little while, and have spent the past few weeks combing through my back catalogue of images trying to find some worth posting in a review. I hope to share more of those soon. For those who haven’t yet noticed, detailed handling comparisons of what I’ve called “Standard Zooms” and “Telephoto Zooms” are online. I have a good start on comparison images as well, but it’s been difficult with the frigid temperatures we’ve been experiencing in Canada recently. Comparison crops are in the works though, and will be posted as soon as possible. 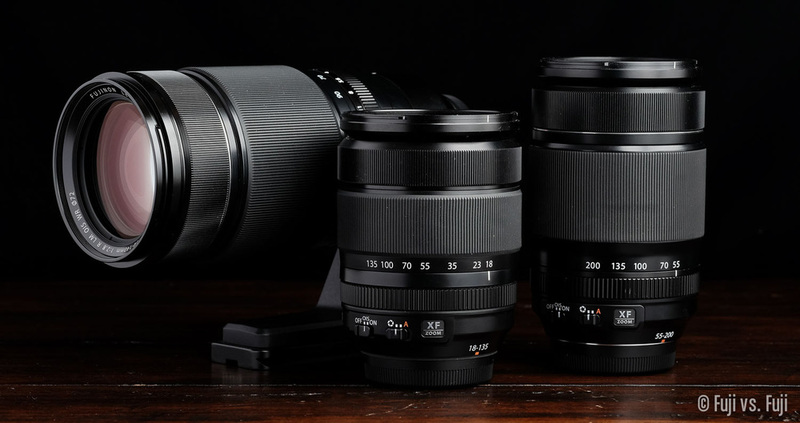 In the meantime, check out my impressions of these new lenses and how they compare as far as handling and build quality is concerned. What a handle. Fujifilm have announced their XF 18-135mm f/3.5-5.6 R LM OIS WR, and they’re getting a little carried away with the initialisms in their product names. We now officially have a new one, one whose purpose has been amended in the marketing materials, and another that’s been updated. 20 points of sealing, but Fuji are once again conservative with their language, and playing it even more safe. Weather Sealed sounds safer to me than Weather Resistant does, but Fuji state their latest lens features a “…dust-proof and weather-resistant design…”. I guess that air ventilator inside the bottom of the lens barrel is what allows them to make the dust proof claim. Does this mean the end of dust inside the the front and rear lens elements? Dust proof sure makes it sound that way. I’m interested to experience the improved feel and smoother operations the air ventilator also provides. Not new technology, but based on the press release, this looks to be responsible for “near silent operation,” and not much else. Previously this feature was noted as being responsible for the 18-55mm’s compact size and fast autofocus. Perhaps the 18-135mm isn’t small enough to warrant the first claim, but I think copywriting may have let them down on the second. Anyhow, I don’t recall ever finding the 18-55mm, or anything other Fuji lens particularly noisy, so it will be interesting to see what kind of difference this newly described tech makes. Likely none. Image Stabilization is now up to 5 stops thanks to high-precision gyro sensors with quartz oscillators. Fancy. If Fuji have actually achieved that, it’s an impressive feat. I remember getting excited about a mere 2 stops not that long ago. It makes me wonder what sort of handheld shutter speeds we’ll be able to get out of this lens. I have to admit that I’m not super excited about this lens. 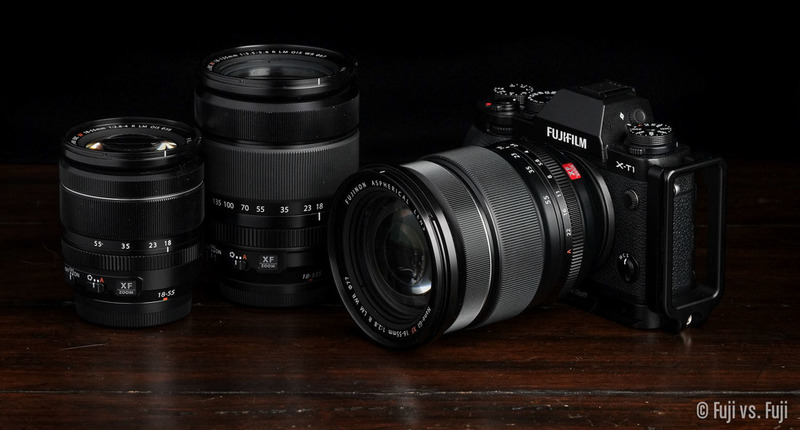 Its release has only made me more anxious for Fuji’s forthcoming FUJINON XF 16-55mm f/2.8. The 18-135mm f/3.5-5.6 starts out pretty slow at the wide end, clocking in at just under ⅔ a stop slower than the XF 18-55mm f/2.8-4 at the wide end, and just gets slower from there. About the only thing that excites me about this lens its weather sealing (or resistance), and what its new features should mean for yet to be announced lenses. If you shoot landscapes in poor conditions, a good strategy might be to buy the 18-135mm now, use it for 6 months until the 16-55mm f/2.8 comes out, and then sell it privately. You’ll lose a little bit on it, but it could be considered an extended rental. It also might be a decent option for those looking for a single, rain-or-shine lens solution. For travel it could easily be the only lens you need provided you aren’t shooting anything that’s moving quickly in poor light. If you do decide to purchase the FUJINON XF 18-135mm f/3.5-5.6, please consider using one of the links below for your preorder. You won’t pay a cent more, but it helps support the site and keeps me testing. Thanks! After weeks of testing, the most thorough “Versus” article yet—the battle of the medium telephoto—is now online. I’m finally approaching the standard I’d like to set for all the Versus content I post on Fuji vs Fuji. This is going to mean some revisions and additions to existing articles of course, and that means more comparisons. I’ve been holding fast to shooting real things as opposed to test charts, brick walls, and staged comparison images. This keeps the image content fresh, and the testing more interesting. This has also been the toughest comparison to make recommendations against. There are really good reasons to own each lens. Ultimately it boils down to your specific needs and your wallet.